As your GemStone repository grows over time, the question may arise about which objects are using that space and how many of them there are, and which classes the objects are. The transparency that makes persistence simple can make it more difficult to see the relationship to the number and classes of objects. There are a number of ways to examine the contents of your repository. In GemStone/S 64 Bit versions 2.0 and later, the GsObjectInventory class provides a way to scan your repository and produce a number of reports on the number of instances of all classes in the repository. This performs a scan of the entire repository, which takes some time in larger systems. Hidden classes are included in this report. ScanBackup is a tool that allows you to read and parse a backup file to produce an instance count of the objects that were written to the backup file. This code is provided as a filein here. This code works in 32-bit GemStone/S (tested on v6.7), as well as GemStone/S 64 bit 2.x, 3.1.x and 3.2.x. To use, file in ScanBackup.gs and commit. Then execute the following, using the appropriate class depending on if you are in 32-bit GemStone/S or GemStone/S 64 bit. It is not strictly required to execute this in the same environment as the backup, however, class OOPs in the backup file are translated to class names based on the current image and may be incorrect for non-kernel classes in an unrelated repository, or a different GemStone product. 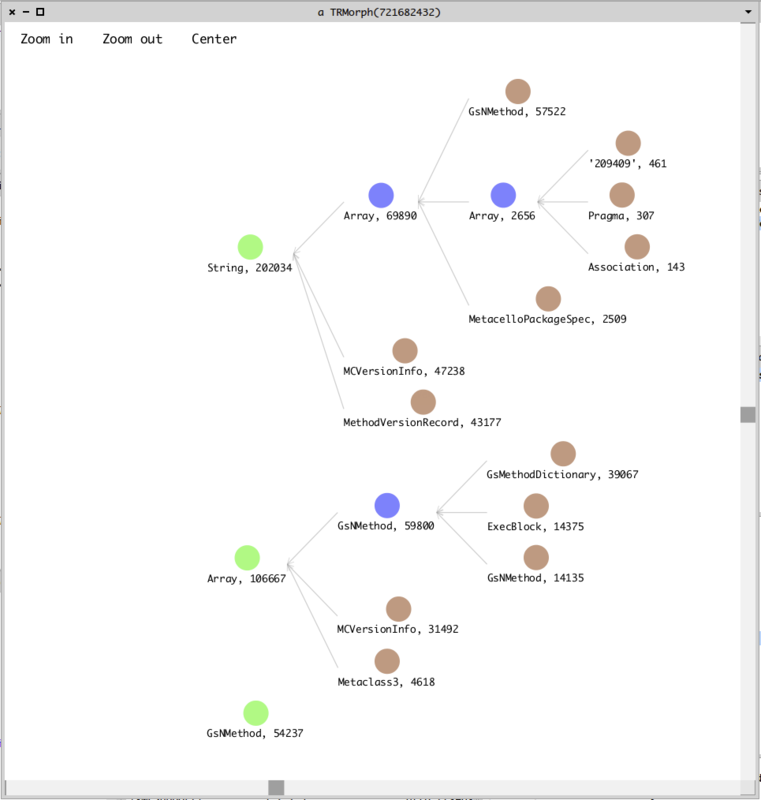 Obex (Object Explorer) is a open-source project that allows you to visualize objects within the repository and interactively explore the contents. This project is currently under active development. See the obex project page on github for current status.